Rainier Community Kitchen is an opportunity for neighbors to gather to cook good food together and go home with meals for their families. 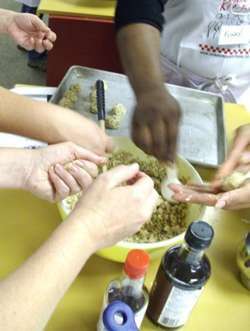 Our combined shopping dollars go to healthy, vegetarian ingredients and we enjoy learning new recipes as we cook together. Currently, we meet on the second Thursday of the month, 6:30-8:30pm. Register by 5pm Wednesday, March 9 for the class on March 10. The fee is $25 and you'll enjoy two hours of camaraderie with your neighbors, a sense of accomplishment, and 4-6 servings of 4 menu items to take home. If you have any questions, feel free to contact Julia Collins at 250-9293 or moc.liamg|snilloc.l.ailuj#moc.liamg|snilloc.l.ailuj. Neat idea! I can't make the kitchen this week but I look forward to joining you at a future gathering.